What are brownies? No I’m not talking about the girl guides who are between the ages of seven to ten and called Brownies. I wonder if they still have brownies and girl guides in schools? I was a brownie and a girl guide when I was in school. No, my post is not on girl guides and brownies, but the brownies from the cookery world. 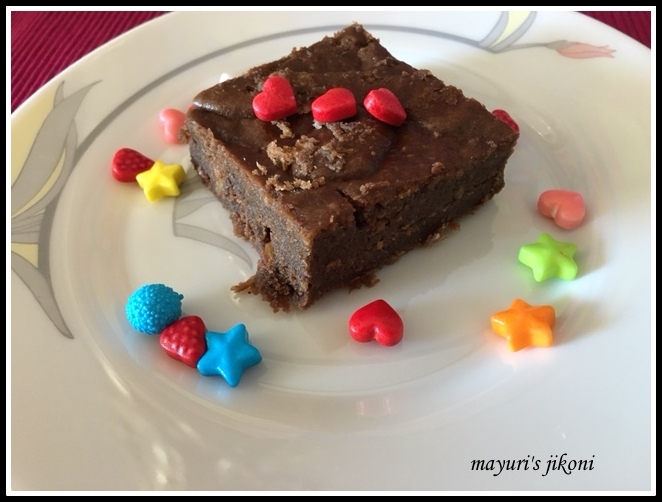 Brownies is a baked flat dessert that became popular in US and Canada during the first half of the 20th century.Depending on the density, it can be cakey or fudgy. They are made with chocolate, either melted chocolate or powder or both with nuts and sometimes dried fruits added to it. You can have a brownie either with tea, coffee or even milk or with a generous helping of ice cream on top to make it really ‘evil’. So what is the main difference between a chocolate cake and a brownie. Well, simple… cakes have a baking agent to make the texture appear crumbly but most brownies have none or very little baking agents to make the texture appear less crumbly. The February shhh cooking secretly challenge was based on a Valentine’s Day theme. My partner Shailaja Reddy of Sahasra Recipes suggested sweet potato and cinnamon as my two secret ingredients. I accepted the ingredients but for a few days had no idea what I was going to make using those two that would fit into the Valentine’s Day theme. Sweet potato halwa kept popping up in my head. But I wanted to make something more exciting for Valentine’s Day, so googled for recipes using sweet potato. Came across sweet potato brownies and immediately knew that that’s what I wanted to make. Thank you Shailaja for making me explore a bit more and not just stick to my comfort zone. Hubby got 2 Valentine’s Day treat as I partnered with 2 members. Check out my strawberry mousse recipe. I loved the brownies because you can get away by using less sugar depending on how sweet the potatoes are. Preheat the oven to 180°C. Grease a 18cm X 18cm square tin or line it with parchment paper. Sift flour, baking powder, cinnamon powder and salt together. Add walnuts and cranberries and mix it into the flour mixture. Take the pan off the heat and add the chocolate chips. Stir till the chocolate melts. Add sugar, sweet potato and vanilla extract and mix it well. Add the eggs and mix with a beater till the mixture appears thick. Add the flour mixture and mix till the flour is wet. Pour the batter into the prepared tin. Make the top smooth. Bake for 20-25 minutes till just baked. Remove the tin from the oven. Let the brownie cool down completely in the tin. I wrapped the sweet potato in foil and let it roast in the oven at 180°C. Peel it and mash the flesh with a fork or masher. Can add nuts and dried fruit of your choice. Adding cranberries adds a bit of tanginess to the sweet brownies. Sprinkle the top lightly with sea salt if you want. if you would like to join this group please leave your name, email address and facebook url in the comment section. I keep meaning to try these, as I always see them on Pinterest. I am interested in what the texture would be like. Danii the texture is not cakey, its a bit fudgy and soft. I love your innovative brownies, The texture is lovely and gooey just as a brownie should be. Interesting recipe. Sweet potatoes in brownies is unimaginable. These look so delicious.